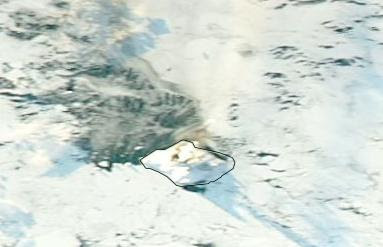 Eruptive activity continues at the remote volcano and might have become more intense recently. Satellite images from past days show ash emissions that appear stronger and more regular than earlier on, drifting into northeasterly directions. Also, recent imagery shows a dark patch on the island itself, near the summit, which could be a new cinder cone and/or associated lava flows. According to the South Sandwich Islands Volcano Monitoring Blog's latest update, the recent satellite images "show some faintly dark lines suggesting the presence of lava flows and also a dark patch just west-northwest of the Mount Sourabaya area."